It has been noted more than once that doing a successful pastiche is a delicate and difficult operation, to be performed only by the best literary surgeons. Someone attempting a pastiche must be intimately familiar not only with the characters and themes that thread their way through the corpus of the author’s works that are being imitated, but also—and this is crucial—the writer’s style. Failing to capture (or recapture) that nearly indefinable aspect of composition—in other words, losing the “voice”—has shipwrecked many a pasticheur. But that hasn’t stopped them from trying. And try they do. No accurate count has ever been made of how many times Sherlock Holmes has been imitated, but it must surely run into the thousands, never mind the countless parodies (which are often wrongly confused with pastiches). When doing Holmes imitations, Loren D. Estleman is about as good as they get; there’s enough of Conan Doyle in there to lull the reader into suspending his disbelief and, for the moment at least, forgetting that he isn’t reading something produced by the Grand Poobah himself. 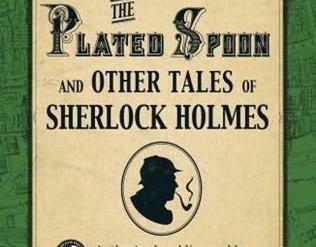 In The Adventure of the Plated Spoon, Estleman has assembled an even dozen authors, all with the same idea of invoking in some way the Great Detective, humorously or in all seriousness. Eight of the selections—by some of the biggest names in mystery fiction—have appeared elsewhere before, with the other four receiving first exposure here. They’re all worth your time, even if, poor soul, you aren’t a mystery reader or a Sherlock Holmes devotee. “No,” said Holmes, “for mere authors only get one press notice a week. Only criminals, dramatists, and actors get them by the hundred.” . . .
“I venture to suggest that that may reflect the shortcomings of Scotland Yard rather than any particular cleverness on the part of the Ripper.” . . .
. . . It was from there, an hour later, that I saw the last of the great Titanic vanish beneath the waves, carrying a victim, a murderer, and a mystery writer with it. . . .
. . . By what agency had Sir Crichton met his death? Did Nayland Smith know? I rather suspected that he did. What was the hidden significance of the perfumed envelope? Who was that mysterious personage whom Smith so evidently dreaded, who had attempted to take his life, who—presumably—had murdered Sir Crichton? . . .
. . . “Yes, Holmes. I was thinking how superficial are these tricks of yours, and how wonderful it is that the public should continue to show interest in them.” . . .
. . . I had, I should mention, always assumed that a large part of Dr. Watson’s adulatory stories were a product of that gentleman’s inferior imagination. Certainly he always regarded the reader to be as slow as himself. Most irritating. Nonetheless, behind the stuff and nonsense of the biographer there towered a figure of pure genius, one of the great minds of his generation. A Legend. . . .
. . . “But you said you had solved the case, Mr. Holmes,” cried our client, in a frenzy of despair. “Yes,” agreed Holmes, “it is solved. You have had the clue in your own hands ever since the occurrence, but you did not know how to use it.” . . .
. . . The light of the tapers, gleaming on a blood-spattered steel blade buried in the lunette, reached beyond to touch, as with a halo, the red-gold hair of the woman who sat beside that dreadful, headless form. Regardless of our approach, she remained motionless in her high, carved chair, her features an ivory mask from which two dark and brilliant eyes stared into the shadows with the unwinking fixity of a basilisk. In an experience of women covering three continents, I have never beheld a colder nor a more perfect face than that of the chatelaine of Castle Arnsworth, keeping vigil in that chamber of death. . . .
. . . Jeff called the butler back. “To quote Mr. Holmes: ‘When you have eliminated the impossible, whatever remains, however improbable, must be the truth.’” . . .
. . . “It hurts to say the game will never be afoot again; but if you do not remove yourself from all this, the Reichenbach may claim a third victim.” . . .
. . . My instinct was to demand an explanation as to how Holmes knew what I had been up to, but that would have been ridiculous. Sometimes, I felt as if I had a tick attached to the back of my neck that told him of my every move and deed. I hate ticks. . . .
. . . I nearly cheered; but what would we find inside, a lady or a corpse? ~ Another, fuller collection of Loren Estleman’s own Sherlock pastiches, The Perils of Sherlock Holmes (2013), is on sale HERE. ~ A related article is HERE.